Your Free checklist has been created by Business First Network, a nationwide organisation whose primary purpose is to help Business Owners gain access to the best legal, tax, employment and health and safety advice in the UK. 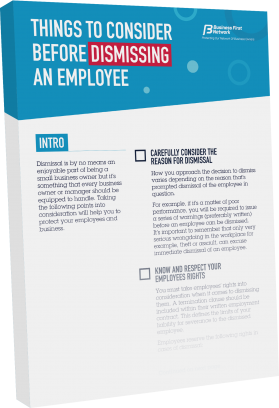 We’re providing you with this checklist to help make sure employee dismissal is the right action for you to take and to demonstrate what we do for our members. Business First Network is a membership organisation that provides support, protection and advice to thousands of UK Business Owners. The BFN support team is made up of serial entrepreneurs who understand the demands of being a business owner. Thousands of members count on this team to deliver solutions to their challenges and equip them with the strategies, tools and support they need to protect and grow their businesses.